In 2004, she fell from an open truck on the way to a "rejuvenation" camp for captive elephants and broke her leg. She lived in pain ever since with a misshapen limb. Recently, she broke her femur when authorities used an earthmover to flip her and treat her. After that, say activists who visited the temple to check on her condition, the largely disabled pachyderm just wasted to death. According to media reports, more than 70 captive elephants have died under "unnatural conditions and at a young age" in private custody in just three states - Kerala, Tamil Nadu, and Rajasthan - between 2015 and 2017. Some 12 captive elephants have died this year in Kerala alone. "Most of these deaths are due to torture, abuse, overwork or faulty management practices," says Suparna Ganguly, president of the Wildlife Rescue and Rehabilitation Centre. It's not surprising to see why. Lack of space and habitat to exercise and graze in natural surroundings means elephants lodged in captivity are shackled for long hours in concrete sheds with stone floors. This is enough to make the animal sick. They usually get foot rot, a condition where their feet develop abscesses and thinning pads, sometimes leading to severe infection. When outside, constant exposure to the glare of sun can affect their eyesight. Ms Ganguly blames this on "gross ignorance on part of the keepers and managers". Then there's the poor diet. Elephants are slow eaters, and in the wild typically eat more than 100 kinds of roots, shoots, grasses, foliage and tubers. In captivity, their diets are severely restricted. In parts of northern India, for example, the animals have access only to glucose-rich dried sugarcane fodder. Vets say many of them suffer from intestinal infection, septicaemia and lung-related infections. The life expectancy of captive elephants in Kerala, according to a report, has dipped to below 40 years from 70-75 years a couple of decades ago. There's not even enough places to shelter rescued and ailing elephants. There are five of them in India - including three private rescue centres - that house some 40 elephants, not enough considering the high population of captive animals. India's Supreme Court has outlawed the sale and exhibition of elephants at a well-known animal fair, and directed authorities to ban the use of elephants in religious functions to reduce their demand. More than 350 captive elephants in Kerala and Rajasthan are "illegal" - they don't have any ownership papers. Despite adequate laws - including a powerful animal protection law and guidelines to protect captive elephants - not enough is being done to protect them, say activists. One reason is captive elephants are a lucrative trade. 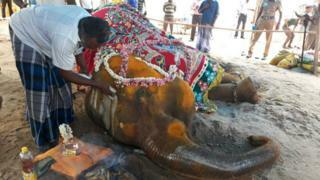 The owner of an elephant in Kerala, for example, can easily make up to 70,000 rupees ($1053; £754) for a single day's appearance at a religious festival during the busy season. "For the first time in the history of India's captive elephant business, the murky underworld of elephant trade has been split wide open - decades of elephant trafficking, the ghastly nexus between poachers capturing young elephants and their collusion with private trade coupled with neglect, corruption and apathy on part of government departments have led to the unacceptable conditions today," says Ms Ganguly. The top court is expected to pass further - and final orders - on protection of the mistreated elephants soon. There may be hope yet.